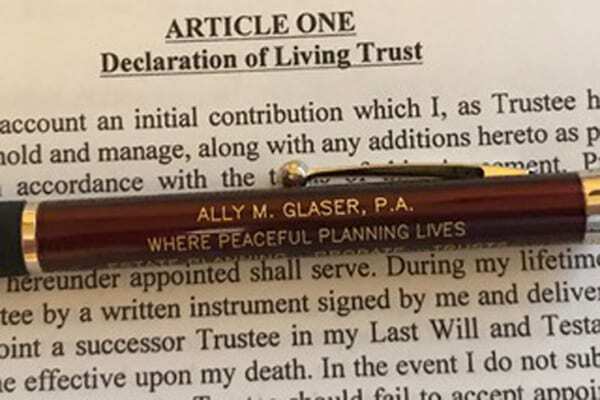 Trust Administration | Probate Administration | Ally M. Glaser P.A. ESTATE PLANNING FOR MINORS- WHY DO YOU NEED IT? By Ally M. Glaser P.A. | January 10, 2018	| Comments Off on ESTATE PLANNING FOR MINORS- WHY DO YOU NEED IT? ESTATE PLANNING AND TRUSTS- HOW CAN I PREVENT PROBATE COURT INVOLVEMENT? By Ally M. Glaser P.A. | November 21, 2017	| Comments Off on ESTATE PLANNING AND TRUSTS- HOW CAN I PREVENT PROBATE COURT INVOLVEMENT? HOW IS ESTATE PLANNING AFFECTED BY DIVORCE? By Ally M. Glaser P.A. | October 16, 2017	| Comments Off on HOW IS ESTATE PLANNING AFFECTED BY DIVORCE?